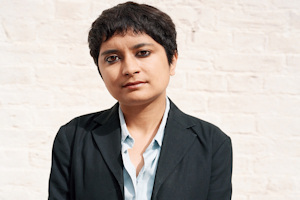 One of the nation’s leading human rights campaigners, Shami Chakrabarti has been made an Honorary Professor of Law at The University of Manchester. The appointment will give students and staff in the School of Law an exciting opportunity to meet with the Director of Liberty, which campaigns to protect rights and freedoms. The announcement follows last year’s successful public lecture by Professor Chakrabarti at The University. A familiar face on TV and radio, she is a regular contributor to on Question Time, Newsnight and the Today programme. In February, she was judged to be one of the 100 most powerful women in the United Kingdom by Woman's Hour on BBC Radio Four. Shami Chakrabarti was also one of eight Olympic Flag carriers dressed in white at the London 2012 Summer Olympics opening ceremony. She said: "Liberty began with the struggles of the Hunger Marchers 80 years ago, and Emmeline Pankhurst hailed from Manchester. So it’s an honour indeed to join a great Northern Law school at a time when rights and freedoms are once more on the line." Professor Geraint Howells, Head of the School of Law said: “I am delighted Shami Chakrabarti has joined our School. She is an impressive advocate for the causes she believes in and will help us in our mission to promote debate about justice. “Last year she took part in a popular event with our students in the School of Law and this post will ensure that they will continue to be challenged by her perspective on civil liberties. Dinah Crystal, Director of External Relations and Clinical Legal Education at the School of Law, is available for interview.